Kitesurfing on Koh Phangan with KITEFLIP kitesurf school! 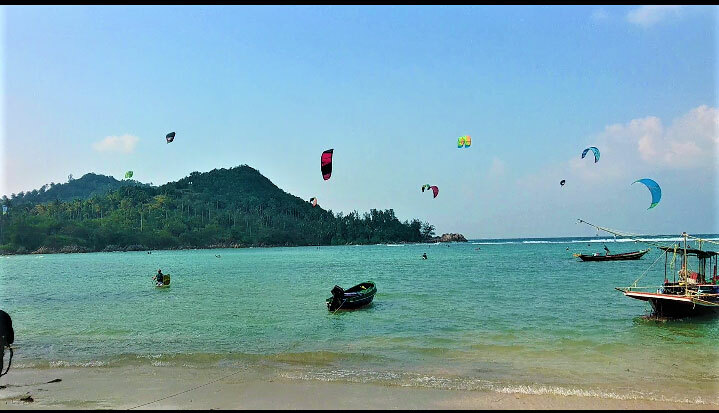 The best place to learn kitesurfing on Koh Phangan is at our main kitespot in the famous Mac’s Bay resort on the south coast of the island of Koh Phangan in the Gulf of Thailand. To get there just drive direction haadrin and you will see a big roadsign 500 meter after the 7/11 in Ban tai. Turn right here and follow the Kiteflip signs. This kitespot is one of the best for kitesurfing on Koh Phangan due to its huge flat water lagoon and big sandy beach area. Here we have the biggest landing and launching area on whole of Koh Phangan. The beach is made out of soft white sand and is cleaned every day. We are also the only kiteschool in a few kilometer radius so you will have the whole place for yourself. There is a big sandbar with waist-deep water so it is ideal for students or beginners who want to learn kitesurfing on Koh Phangan. Since you can stand everywhere it’s easy for a student to learn how to control the kite and walk back with the kite if necessary. At our main location we provide kite storage, air compressor, fresh water to clean your kite, showers and toilet, chill-area with hammocks and beanbags, dj-booth, pool, restaurant, etc… basically everything you need. Every customer can use our facilities for free. The only thing we ask in return are good vibes. To check out our accommodation options @ Mac’s bay resort click here. The best time to kitesurf at our main kite spot is from january till may. 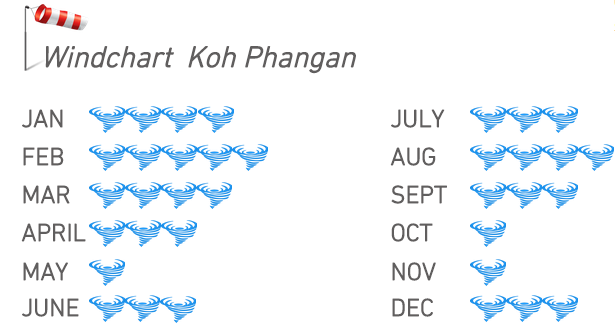 This is also in general the best time to go kitesurfing on Koh Phangan. The wind is pretty consistent during this season and blows from the south east. This means it’s side onshore at our kite spot. 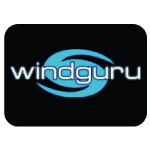 We have winds between 10 and 20 knots which are ideal for beginners as well as more advanced riders. We advice people who bring their own kite to bring their biggest kite (12 +). Other reasons that this is the best time for kitesurfing on Koh Phangan are the nice temperature and the absence of rain. This is winter time in Thailand which means it’s dry season and temperatures are between 20 – 28 degrees Celsius. You can kite in board shorts or bikini, just don’t forget to use sunscreen! Our second location is located 100 meters left from the pier in Tong Sala in a beautiful resort called ‘The Pier’. To get there just take the small road at the main intersection in Tongsala (at Homemart) direction the coast. Then just go straight ahead, then turn right at the intersection and look for the big bamboo entrance with the sign of ‘The pier’. Kitesurfing on Koh Phangan is easier when you can choose between the best locations. The main reason we move to this place in the summer is because of the tide. The water gets too shallow at Mac’s bay resort after April and at this spot the water level is just perfect waist high during that time. The nice thing about this spot is that the reef is further distant from the beach so the spot is more wide and this gives us more space to kite. Our facilities at this spot: Storage, shower, toilet, chill area, air compressor and restaurant. All facilities are free to use for our customers. The Pier is a beachfront resort with new designed colorful bungalows and also dormitory options. It is the biggest beachfront resort in this area which makes it ideal to land and launch our kites safely. 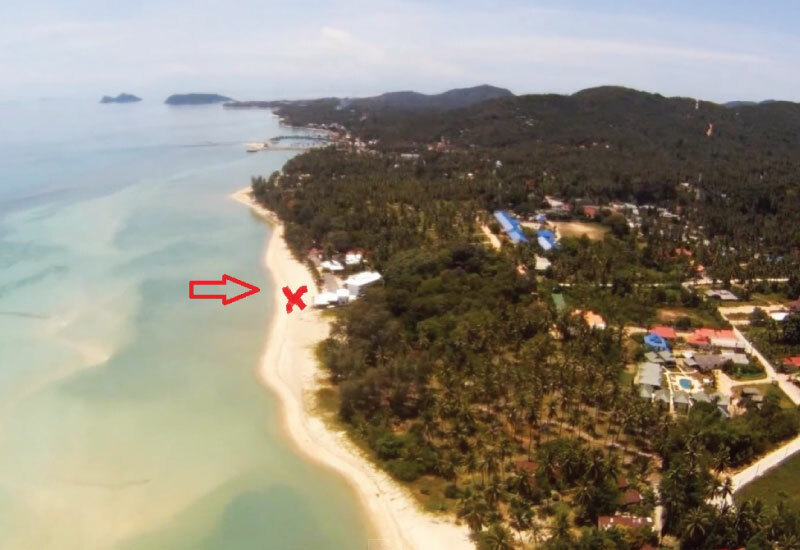 This spot is best for kitesurfing on Koh Phangan between July and Oktober. During these months the wind blows from the south west which means side onshore at our spot. Again ideal for beginners and advanced riders. This time of the year we can experience some storm fronts which bring strong winds. Experienced riders can have a lot of fun boosting big airs! On average we still ride with 12m or 14m but its good to have a small kite like a 9m with you in case you like to do some storm riding. The wind consistency is a bit less compared to our main season but we still get some really nice windy days. 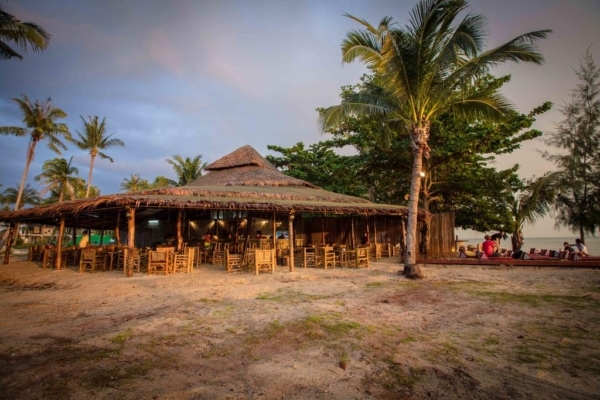 Our third spot is located on the beach of Chaloklum bay resort in Chalokum in the north of the island. This spot has a small beach to setup the kites and flat water lagoon with waist high water. This is our ‘go to spot’ which means we drive their from our main spot with all the equipment. We only use this spot for a short time in the month December when the wind comes from the north. Most people who come kitesurfing on Koh Phangan this time of the year will be kiting on this spot so we have to share the spot. The north winds usually range between 12 and 22 knots. This is the only time of the year that it can be a bit cold on the water so it’s good to bring a shorty. Take the night bus from Bangkok to Koh Phangan. You can find different companies offering this route. Best way is to ask in your hotel in Bangkok and they will probably be able to arrange it for you. Most buses leave around 7-8 pm and you will arrive around 11.30 am on Koh Phangan. Price is around 700-900 baht. 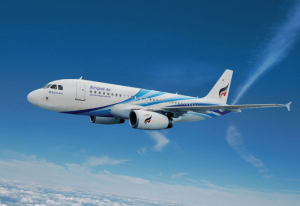 Take a flight from Don Muang airport in Bangkok to Surathani Airport. You can choose between different airline companies like Airasia, Nok air or Thai lion air. Flight takes 1 hour. Price is around 1000-1200 baht. Book in advance to get a cheap rate. Once you have arrived in Surathani you can take a bus from the airport to Donsak pier which takes about 2 hours. After that it’s 2,5 hours ferry till Koh Phangan. Usually they sell a join ticket at the airport (bus and ferry combined) for 400 baht. Make sure you arrive latest in Surathani at 4pm because the last ferry leaves around 6pm in Donsak. If you don’t want to miss any of your precious time kitesurfing on Koh Phangan it’s best to get here the fast way. This means to take a plane from Suvarnabhumi airport in Bangkok to Koh Samui (the neighboring island of Koh Phangan). The two airlines that fly this route are Bangkok Airways and Thai Airways. The flight takes an hour and cost around 4000 baht. Again the more in advance you book the better the price. Once arrived in Koh Samui you take the ferry to Koh Phangan. A few different boat companies offer services from Samui to the Thong Sala Pier in Koh Phangan which are located near the airport. The Lomprayah catamaran takes 20 mins and leaves Mae Nam beach on Koh Samui at 8am, 12.30 pm and 5.30 pm. There is also Seatran Express at 8:00 am and 1.30 pm leaving from Bophut. The last boat from Koh Samui leaves Bophut 6.30 pm and arrives at Haad Rin beach on Koh Phangan.